Summary: The FOMC is likely to enact a third hike in the federal funds rate this week. With economic data continuing to be good, the risk to equities of a rate hike is small. Higher rates indicate continued economic growth, so equities, commodities, the dollar and yields generally respond positively. However, the recent picture is more mixed: in particular, the dollar and yields have sold off after rates have been hiked. This was not the consensus' expectation, nor is it this time. Is another surprise likely now? On Wednesday March 15, the FOMC is likely to raise the federal funds rate (FFR) for the third time during the current economic expansion. We wrote about what to expect ahead of the first rate hike here and the second rate hike here. The Fed chair and its governors have very clearly signaled their intentions in advance of this meeting. The market places the probability of rate hike at over 90%. In just over a week, 10 year treasury yields have jumped 30 basis points (bp) to their highest level since December 15. Why has the Fed telegraphed their intentions to the market so clearly? Doesn't this tie the FOMC's hands should interim data make a FFR hike unnecessary? The FOMC has learned that surprising the market with a FFR hike is a very bad idea. With the SPX rising 15% since the election, a surprise would likely catalyze a big drop. Here are two examples of how this has happened in the past. The 1966 bear market is one of only two bear markets since the 1940s that occurred outside of a recession. The approximate cause: the FFR was rapidly and unexpectedly raised from 4% to 6% (read more here). More recently, the FOMC surprised the market with just a 25 bp FFR hike in February 1994. Going into the meeting, the market put only a 20% probability of a hike. What happened next? The SPX fell 10% in the next two months. So keeping the market constantly prepared for a possible change in the FFR has been the FOMC's modus operandi for a long time. It's important to put the upcoming rise in the FFR in context. There is, to be clear, very little risk that any FFR hike is likely to choke the economy's expansion. In the past 60 years, the lowest effective FFR which has coincided with the start of a recession is 3%. The current rate is 0.65%. Outside the current expansion, the current rate is the lowest since 1958. In addition, each expansion in the past 60 years has been accompanied by dramatic and sustained increases in the FFR before the economy has stumbled. We are very far from this situation right now. If equities continue the small correction that started in the past week, it won't be due to the FOMC's decision to raise the FFR by 25-50 bp. 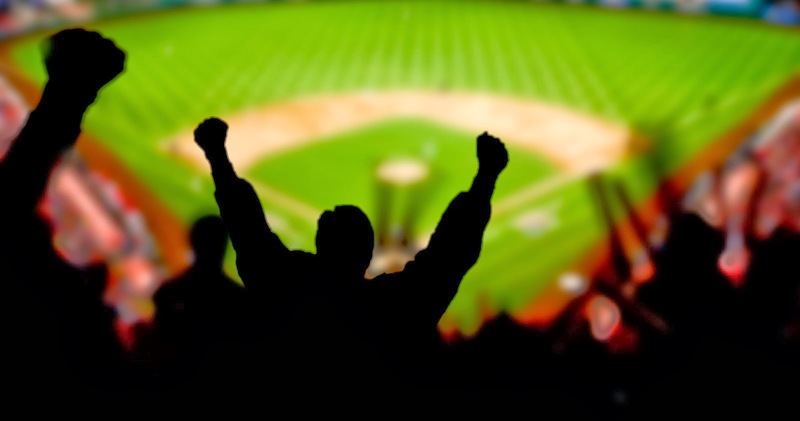 The latest month's macro economic data continues to be mostly good. The risk of a recession-induced bear market in equities remains low. A fresh post on the latest data is here. A solid macro foundation is important, as equity bear markets almost always take place within the context of an economic decline (read more about this here). While a hike in the FFR itself is unlikely to have a meaningful fundamental impact on equities, it's worth noting the equity action after the first two hikes this cycle. The first FFR hike was in December 2015 (vertical line on the left); the rally in SPX had already stalled 7 months earlier, pressured by falling earnings and oil prices. For those reasons, not the hike in the FFR, SPX dropped 12% over the next two months. The second hike was in December 2016, a month after the election (vertical line on the right). SPX chopped sideways over the next 6 weeks. Commodities are typically the biggest winner during a rising interest rate environment, and that has been the case so far this time as well. A new uptrend in industrial commodities started with the hike in the FFR in December 2015. That should make sense: a rising FFR indicates solid growth and rising inflation expectations, both of which raise demand for commodities used in production. Note the short-lived negative reaction in commodities immediately after both FFR hikes. The dollar has sold after the last two rate hikes. 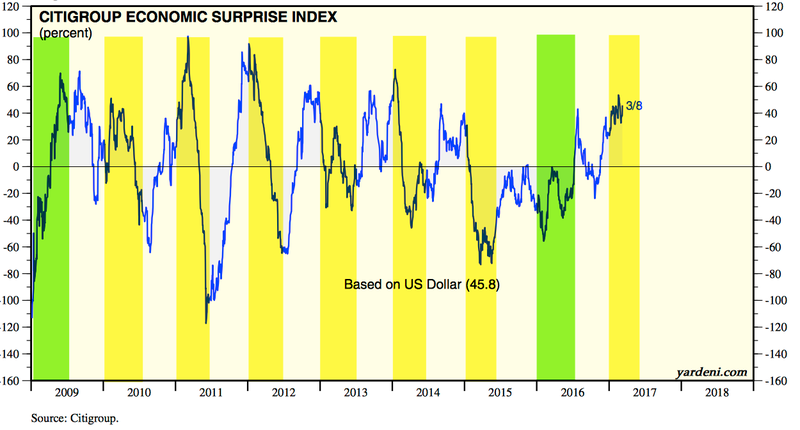 We have noted the bullish extreme in dollar sentiment into both rate hikes (here). The dollar has risen in anticipation of higher rates and then sold off once those higher rates were realized. The most interesting asset class at the time of a FFR hike is treasuries. Yields fell dramatically in the 6 months after the FOMC raised the FFR for the first time in December 2015 (vertical line to the left). 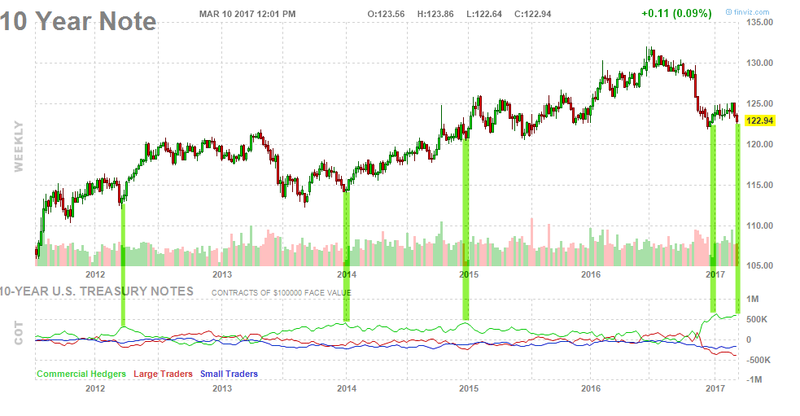 Again, the context was economic fears heightened by falling oil prices and weak inflation data. That makes the second rate hike on December 15, 2016 so interesting. 10 year yields dropped immediately (vertical line on the right). Until Fed speakers started talking up the rate hike a week ago, yields remained in decline. All of that was reversed in just the last 8 sessions and yields are now exactly where they were on December 15th. This is noteworthy because yields falling after the FOMC starts raising rates is decidedly not what has typically happened in the past. The next two charts below look at the start of every FFR hike cycle since 1983. 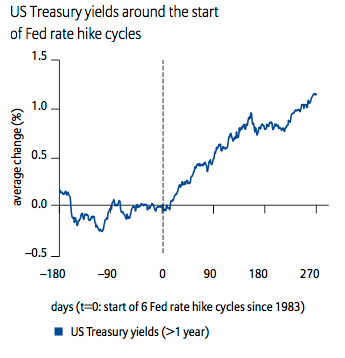 The first chart shows how treasury yields have typically risen after these rate hikes (from Allianz). The second chart shows 10 year yields with vertical lines drawn to show the timing for the start of each FFR cycle since 1983. Yields have a strong tendency to rise with the FFR. Again, that shouldn't be a surprise as a higher FFR indicates solid growth and rising inflation expectations, both of which tend to raise yields. But there was a notable change in the pattern starting with the FFR hike cycle during the last expansion in the 2000s (orange shading in the chart above). The FOMC raised the FFR 17 times between June 2004 and June 2006 (green vertical lines in the chart below). 10 year yields mostly fell after these FFR increases. Between the first rate hike and the 14th, yields had declined on a net basis. Yields, in fact, did not even bottom until the 9th rate hike. Most of the overall gain in yields during 2004 and 2006 took place in the final 5 months of the cycle (rising 90 bp). The final FFR hike (labelled #17) marked the high in yields which has still not been surpassed in the subsequent 10 years. Macro data was fine during this period. Personal consumption ranged between annual growth of 2.5% and 4.5%; this is generally higher than it has been during this cycle (the latest data shows growth of 2.7% yoy). But, like now, core inflation was muted: at the start of the rate cycle, PCE was 2% and rose only to 2.3% by the end of the cycle two years later (blue line). That makes this week's FOMC meeting interesting. Treasury yields have moved up in anticipation of a rate hike, yet, as the chart above shows, core inflation is still 1.9%, barely higher than it was a year ago (1.7%).Treasury yields fell after the last two FFR hikes just as they also most often fell during the 2004-06 cycle as inflation remained muted. So, are rates likely to fall again after next week's FFR hike? The technical picture is mixed. On the one hand, "price" tends to resolve in the direction of the trend. Yields have risen strongly since the summer 2016 and have since consolidated over the past 3 months. Normally, we would expect yields to continue in the direction of their trend, meaning higher. 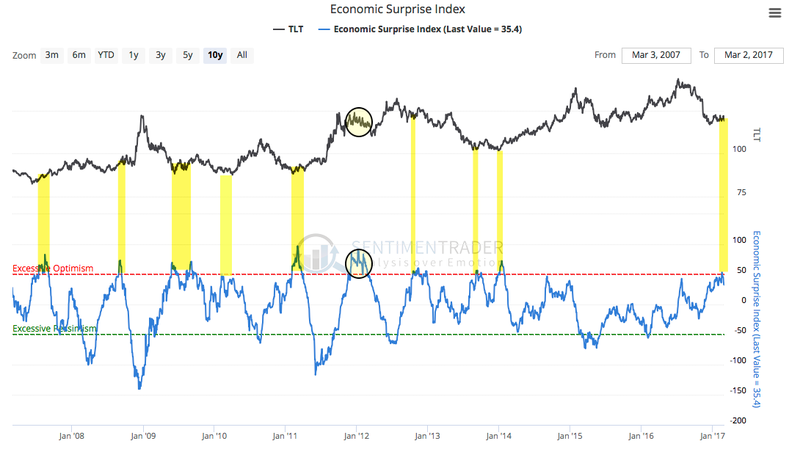 On the other hand, yields have had a very clear pattern over most of the past 20 years: a momentum high (RSI near or over 90; black arrow) followed by a "price" high (red arrow), after which yields mostly fell. What further makes a rise in yields suspect is this: the FOMC is expected to raise rates just as macro expectations are at their most optimistic relative to underlying economic data in the past 3 years. Macro expectations are frequently mean reverting; that make sense as investors and prognosticators can get too far ahead (or too far behind) the actual data, leading to disappointment (or an upside surprise). In the current expansion, expectations have most often started the year too optimistic and then declined into mid-year (yellow shading). 2009 and 2016 were exceptions, beginning weakly and then moving higher (green shading). When, like now, expectations are very optimistic, treasury yields tend to fall. Treasury prices move opposite yields and so they rise (TLT is shown in the upper panel). That is what happened at several points during the 2004-06 expansion, some of which coincided with a FFR hike (as indicated by a #). The same pattern of excess optimism coinciding with a decline in yields (and thus a rise in TLT) has generally occurred in the period since then. The final point making a sustained rise in yields suspect is that commercial bond traders (who are considered the 'smart money') now have the largest long position in the 10 year note in history (green line, lower panel). They have mostly been right, with note prices rising subsequently (upper panel). 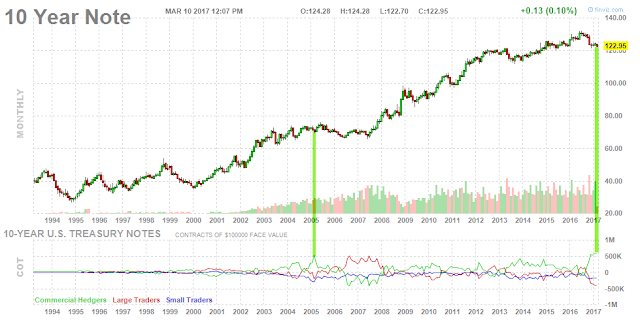 In fact, the only time when commercial traders were comparably long the 10 year was March 2005, ahead of a 3 month rally in notes. 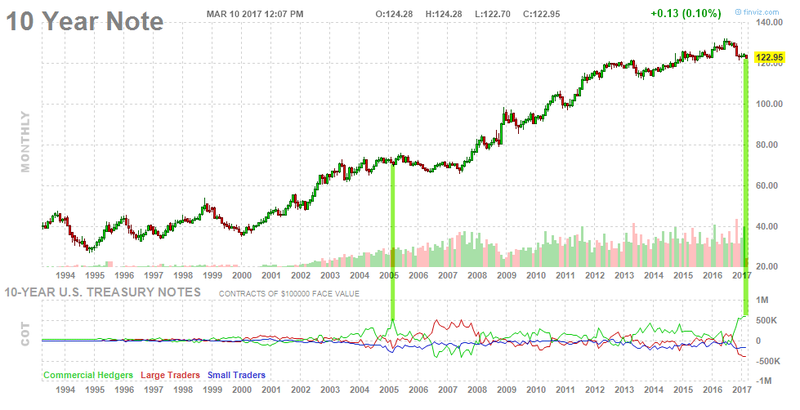 TLT rose more than 10% by May 2005. The long lens of history suggests that yields should rise with a rising FFR and with improved growth and inflation. Yields are also low relative to their level a decade ago when inflation was at a similar level. That is the consensus view of what will happen now as well. 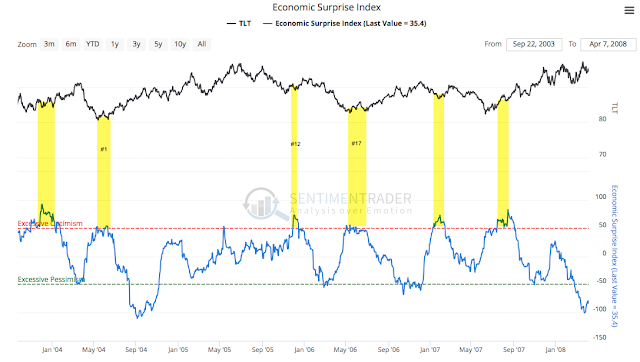 That may well be right, but recent history, as well as the commercial traders who are most often right, suggest that the consensus will be surprised.